The word ‘ANAHATA’ generally relates to a sound or a naada. The Anahata naad is a sound of the celestial realm. Anahata means unstruck or unbeaten. Anahata naada is not caused by any external friction, it is not the result of striking or beating certain things. Anahata naada is a mystic sound that occurs spontaneously. Anahata literally means “the sound is not made by two things striking together”. It is said that during deep meditation these are the mystical sounds heard. Descriptions of ten such sounds are available like the sound of bell, conch, flute, drum, mridanga, clouds etc. These ten sounds are the subtle sounds which indicate the progress in yog sadhana. Pranayama is the major tool available for the purification of mind and body. Anahata naada is the sign of purification of Nadis due to pranayama. The heart Chakra is in the center of the chakra system, three chakras below and three above of it. This is a meeting place for physical and the spiritual meet. The first three chakras namely Mooladhar (root ), Swadhisthan (Sacral ) and Manipur (solar Plexus ) can be related to our physical needs, above three Chakras namely Visshudhi ( throat Chakra ), Agnya (third eye chakra), and Sahastrar Chakra can be related to our spiritual journey. Anahata Chakra or the heart chakra can be said the starting point of our realization of our spiritual needs, so it is the starting point where you can start your journey to listen to the Anahata naad . It is a journey from KOHAM to SOHAM. spiritual journey starts from the very basic question of KOHAM ? i.e. who I am ? and one reach at that state when he says I am SOHAM i.e. That I Am, I Am That. Though most of us unaware of the fact that continuously, we are doing Ajapajap (continuous chanting) of SOHAM at least 21,000 times in 24 hours. Close your eyes and just concentrate on your breaths, when we inhale a sound of soooo takes place and while exhaling the sound is huum, so this cycle goes on. SO and HAM, if just we concentrate on our breaths, it tries to remind us that we are SOHAM, I AM THAT, THAT I AM. The need for Spiritual awareness starts at this Chakra, So this Chakra may be named as ANAHATA CHAKRA. 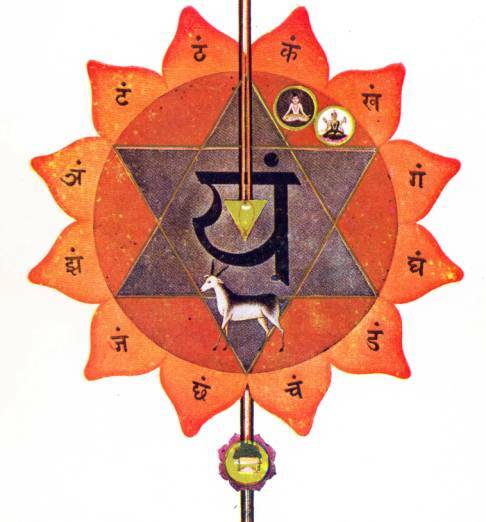 This Chakra is located at the center of the chest, align to Cardiac Plexus, at the 1st Thoracic Vertebrae. On the symbol of the Anahata / Heart chakra , 12 red petals inscribed with 12 Sanskrit syllabus each represents 12 vrittis i.e. lust, fraud, indecision, repentance, hope, anxiety, longing, impartiality, arrogance, competence, discrimination, and defiance. Two triangles forming hexagram symbolize Shiv and Shakti, Purush and Prakriti, masculine and feminine, Spirit and matter coming together in harmony. The color of the Anahata Chakra is associated with Green, as green color equalizes, relaxes and calm down the person. Green color also helps in heart problems, high blood pressure,cuts, burns, and bruises. The Anahata chakra itself associated with balance, calmness, and serenity. It is associated with love and compassion. The beej mantra is the one-syllable mantra which can be recited to tune to the vibration of the Chakra. As sound is a vibration, every Chakra has its own specific vibration and reciting / chanting the beej mantra is beneficial. The beej mantra of the Anahata Chakra is YAM. Dysfunctioning of the Heart Chakra can be a symptom on physical as well as mental and emotional level. As the location of the Anahat Chakra is near a physical heart, the dysfunctioning can result in heart palpitations, high or low blood pressure, chest pain , heart attack, lung problems. 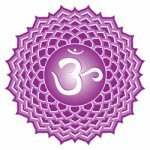 The associated gland of the Anahata Chakra is Thymus gland, the dysfunctioning of this chakra can majorly impede immune system functioning. Underactive Heart chakra can lead to negative thinking, feeling isolated and lonely, finding oneself unloved and unworthy whereas Overactive Heart Chakra result in behavioral problems such as manipulative and over critical. The person will be ruled by his emotion. Yog Sadhana : Daily practice of Bhujangasana (Cobra pose), Matsyasana( fish pose), Dhanurasan (Bow pose) and Ustsrasan (Camel pose) is very beneficial while treating the Anahata Chakra. Mantra therapy : YAM is the beej mantra of the Anahata Chakra, so Chanting this seed mantra is necessary to get tuned to the vibration of this chakra. Color therapy : The primary color of the Heart chakra is Green, so using more Green in your surrounding, wardrobe, jewelry can be recommended. Pink can be used as a secondary color for the Heart Chakra. Nourishment : Green leafy vegetables, celery, broccoli, cabbage, should be included in the diet. Crystals : Emerald, jude, Green tourmaline, Malachite, Rose quartz, watermelon tourmaline can be used effectively. Aromatherapy : Lavender, Rose, Ylang-Ylang, Sandalwood. Affirmations : I live in balance, in a state of Gracefulness and Gratitude. Element : The element of the Anahata Chakra is Air, so going out walk in, feel the breeze and strengthen the element in the body . The Anahata Chakra bridges the lower and upper Chakras, so it should be treated very carefully, so go green and have a healthy Heart Chakra !!! 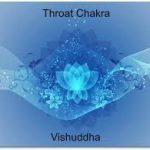 Let's see the Throat Chakra meaning.. THe wrtings are like a treasure. Thank you for this information. Hey Barry, thanks for your comment.